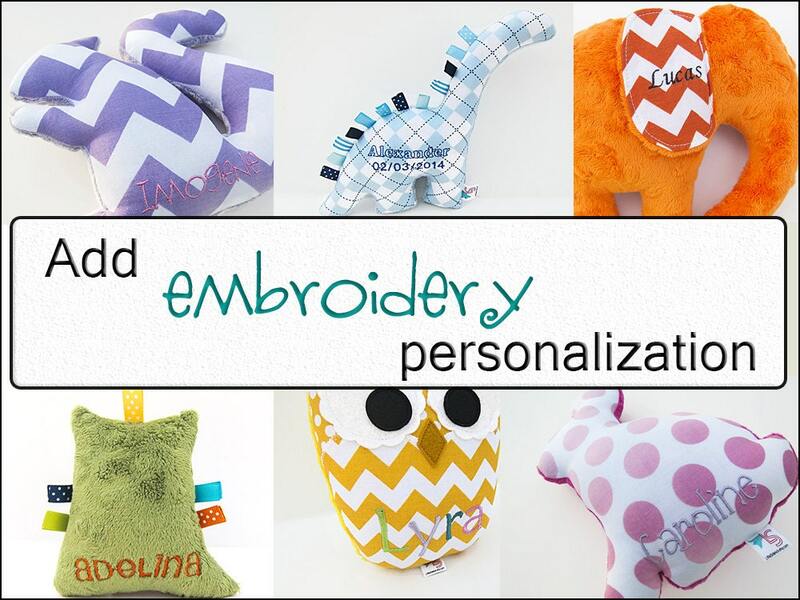 I'm so pleased to be able to offer machine embroidery and monogramming to any plush animal now. Purchase this listing in addition to a plush animal, and I will personalize it for you! Add a name, monogram, birthdate… if it will fit, I can do it! 1. CHOOSE YOUR FONT COLOR from the first pull-down menu. 2. CHOOSE YOUR FONT STYLE from the second pull-down menu. Font styles can be viewed in the second photo. 3. LEAVE ME A MESSAGE in the space provided at checkout, providing me with the name or text you would like embroidered. Each line of text can be up to 10 characters long, including spaces and punctuation. If you would like to add a second line of text like a birthdate, I am happy to do so free of charge, just make sure each line is 10 spaces or less. 4. IF YOU ARE PURCHASING MULTIPLE ANIMALS, BUT ONLY WANT ONE EMBROIDERED, please make sure to tell me which one in the "notes" section at checkout! a) if you'd like all the animals to have the same font and font color, simply change the quantity of this listing to equal the number of animals you are purchasing. b) If you want different font options for each animal, choose the options for the first animal, click "add to cart", then come back to this listing and do the same for the next animal… and so on. You'll have to let me know in the "notes" section which font/font color and text goes with each animal. c) If you are thinking, "This is so confusing! Can't I just contact you first, let you know what I want, and have you set up a custom listing for me?" Of course! I'm happy to help. Some fonts or thread colors may not show up well on busy prints, and some fonts may not be suitable to embroidery on the minky side of your plush. If you have a preference for whether your text appears on the cotton print side (front) or the minky side (back) of your animal, please let me know, otherwise I will make the determination myself, based on the font and thread color you've chosen, and where I think it will look best. Please be aware that some of my animals have a limited area that can be embroidered. I will have to decide on the best placement for your embroidery based on where the text will fit on the animal. If you have strong preferences about text placement, please mention it in the "notes" section when you check out. I will contact you if I anticipate any problems with the options you've chosen. If you have any questions at all about purchasing the embroidery option, do not hesitate to contact me! I'm here to help. Great stitching and good quality thread.